This is a sponsored post through a partnership with organicgirl and the Tampa Bay Bloggers to promote the #GetUrGreenOn campaign. I received compensation for sharing an original recipe. All opinions are my own. For those of you who don't know, I recently got a promotion at work! I am now a regional event specialist and that R word means travel. While it's my dream job, I've gained 5 lbs since the first of the year. My favorite thing is to explore restaurants while traveling and I'm always looking up ones featured on Travel Channel or Food Network. This is why I religiously eat salads for lunch when I am working from home. One of my favorite salads is a Thai Chicken Salad but that usually is full of calories due to the dressing used. So I combined my favorite summer recipe (Thai Quinoa) and added it to a salad with baked lemon agave sriracha chicken and made magic happen. 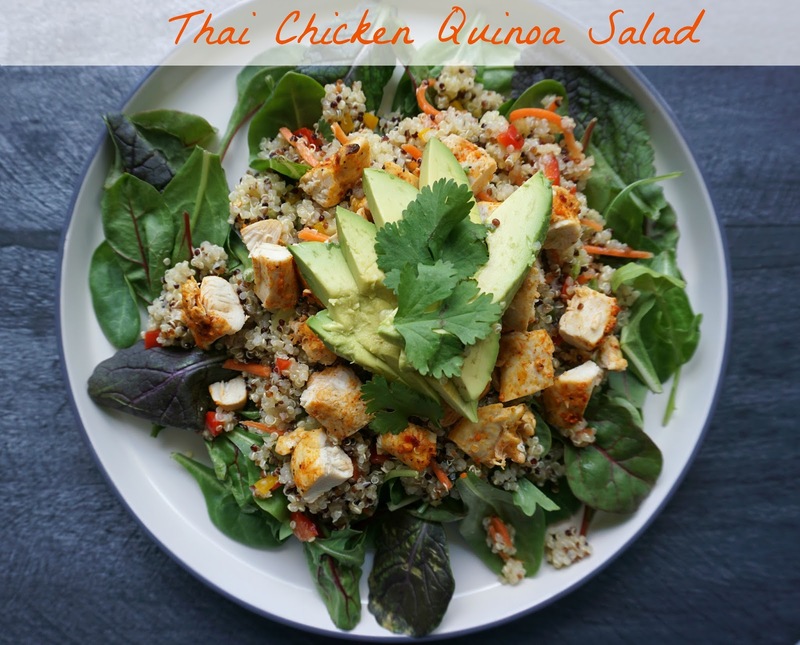 This salad is so easy and can be made in advance during meal prep. The Quinoa and baked chicken stays good for several days in the fridge. 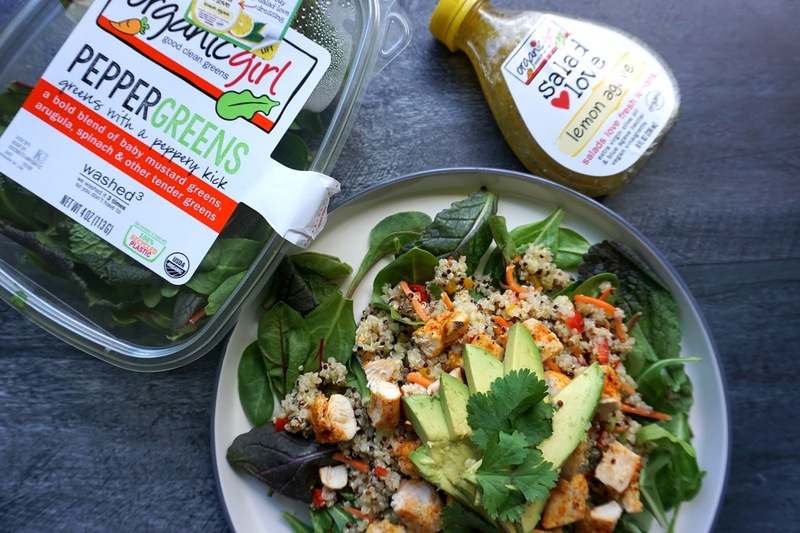 I made this salad using OrganicGirl Pepper Greens which had a nice peppery flavor to it that mixed well with the ingredients. For the chicken, I used OrganicGirl Salad Love Lemon Agave as the marinade base. It's a thick dressing and was a great marinade for the chicken. Marinade the chicken in the dressing and olive oil for 20-30 minutes. If you couldn't find the sriracha dry seasoning, add the liquid to the marinade. If you have the dry seasoning, sprinkle on all sides of the chicken after the marinade process. Bake at 400 for 25 minutes, flipping once. Cook the Quinoa according to instructions. Meanwhile chop the rest of the ingredients, place in a large bowl and make the dressing (recipe below). Once your Quinoa is cooked, add to the bowl with the ingredients and the dressing, place in the refrigerator until the chicken is cooked. Combine all dressing ingredients in a bowl and whisk. Place a cup of prepared Quinoa Salad over OrganicGirl Pepper Greens. Top with the baked Lemon Sriracha Chicken and a sliced avocado. Now for the Giveaway! Go visit OrganicGirl through the rafflecopter widget below for chances to win a great prize pack of OrganicGirl product!